In the late 1940’s and early 1950’s, scores of Cuban musicians found success playing in American. Chico and Rita were two of them—almost. 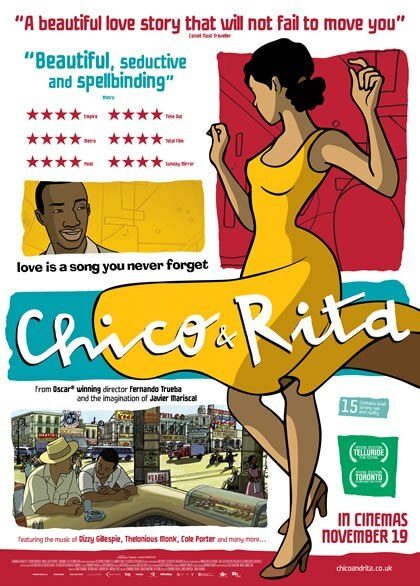 Their Afro-Cuban musical romance is told in Fernando Trueba, Javier Mariscal, and Tono Errando’s Chico & Rita (trailer here), one of eighteen officially submitted films in best animated feature Oscar race and a 2011 European Film Awards nominee, which screened at this year’s African Diaspora International Film Festival. Chico is a Bebop influenced piano player and something of ladies man. Rita is a stunning vocalist and all woman. During their first auspicious meeting, sparks fly and maybe a few faces are slapped. However, when Rita reluctantly sings Chico’s newest song in a radio competition, it is magical. Suddenly, Chico & Rita are the band to book. They also start to admit their mutual attraction, but circumstances keep getting in the way. Before long, Rita is signed by an American producer, who whisks her away to New York. Chico eventually follows her, hoping to gain entree into the jazz scene through his old compatriot, Chano Pozo, whose tenure in Dizzy Gillespie’s band led to the creation of the so-called Cu-bop fusion of Bebop and Afro-Latin Jazz. Of course, those who are familiar with their jazz history know Pozo is not long for this Earth. Likewise, Chico & Rita’s rekindled romance appears equally ill-fated. As the director of Calle 54, the best musical performance film frankly ever, Trueba’s participation inspires confidence and he does not disappoint. 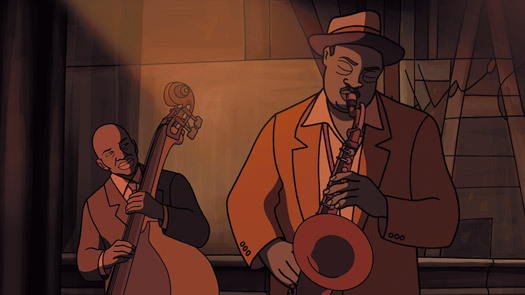 C&R is an instant jazz classic, featuring infectious and sophisticated original music by Bebo Valdés, whose life sort-of-kind-of inspired Chico’s story. But wait, there’s more, including the classic music of Bud Powell, Dizzy Gillespie, Thelonius Monk, and Woody Herman’s Four Brothers band, performing Igor Stravinsky’s Ebony Concerto (which Chico sight-reads early in the film). Still, not convinced? How about Freddy Cole performing one of Chico’s songs as his famous brother Nat, tenor saxophonist Jimmy Heath channeling Ben Webster, flamenco singer Estrella Morente appearing as herself, and a whole lot of Afro-Cuban percussion interspersed throughout the proceedings. Movie musicals do not get much cooler than C&R. Yet, it is also deeply romantic and scorchingly hot (beyond the music). Frankly, it’s a bit of a surprise gkids picked it up for American distribution, but it is a testament to their good taste nonetheless. 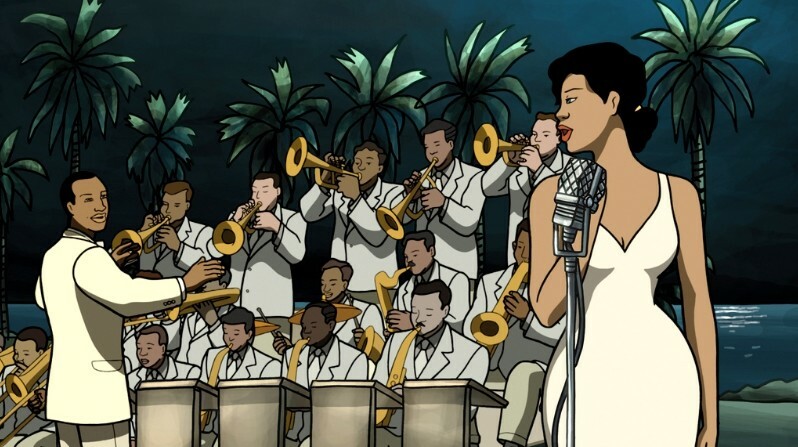 To their credit, the filmmakers do not ignore the grim realities of Castro’s Cuba, depicting the mean living standards, frequent blackouts, and official government suppression of that “Imperialist” music called jazz. Indeed, this is especially surprising in a contemporary Spanish film, though C&R duly and fairly decries the American racial segregation of the era as well, maintaining an ideological balance. While C&R sounds fantastic, it also looks great. Rejecting strict realism, animation designer Mariscal’s figures compellingly evoke the spirit of Art Deco and Old Havana. In contrast, C&R’s backdrops are often much more detailed, giving the audience a virtual tour of the city at the height of its glory. All the elements fit together into an elegant, sensual, and ultimately moving film. It is recommended for anyone with a romantic spirit, but jazz fans will truly flip for it. In a year when the Pixar film was lukewarmly received, voters in the Academy’s animation wing should give C&R serious consideration. Regardless, it was one of the highlights of the typically diverse 2011 African Diaspora International Film Festival, which continues through December 13th at venues across Manhattan.